Hi everyone. It's been a while since I last visited because everything has been going quite well. However, in the last 3 weeks or so I have a crazy amount of tan algae or diatoms in my 29 gal aquarium. I do water changes once a week and it doesn't help matter of fact the day after a water change there is the same amount if not more. I don't really see anything on the glass, but the artificial pants and decor are just coated with it. How do I get rid of this? This is typically a newly set up aquarium thing. It doesn't last too long. The easiest way to get it off the glass is to simply wipe it down. Off the plants, take them out and set them someplace where they can dry for an hour or two and them put them back in the tank. Diatoms don't like to dry out. On a cookie sheet in the sun out doors works fantastic! How much water are you changing %wise ? Is your tank stocked sensibly? How high are your Nitrate readings? Ancistrus (Bristlenose) plecos are great as well.. Taking the decor out and letting it dry out in the sun for a few days works wonders for killing algae on artificial stuff like plastic plants...You wont even need to scrub them...I usually take them out and replace them with others....Its a good excuse to rescape a tank if youve become bored with it....Just dont stress the fish too much...Be gentle! I have a 29 gal tank that I change about 11 gal of water once a week. I believe that my tank is sensibly stocked. I have 5 tetra, 3 killifish, and one clown pleco. My nitrate readings are anywhere between 20 and sometimes as high as 80. They go up and down a lot when I do the water changes because we have a lot of ammonia in our tap water and even though I treat it, there usually ends up being .25 ppm when the water change is all said and done and I let that take care of itself because I don't want to overload the tank with too many chemicals. As for my ten gal, well I know that it is way beyond overstocked because I have had two batches of guppy fry and honestly don't know what to do with them. I thought I had some given away but they change their minds. But believe it or not the water in that tank tests almost perfect, except the pH runs about 7.6.As for leaving the decor out for a few hours to dry, well I will definitely give that a try. But there is never,ever really much of anything that collects on the aquarium glass. Your nitrates are pretty high. That might explain your algae. I would increase the volume of water that is changed each week to about 15 gallons. 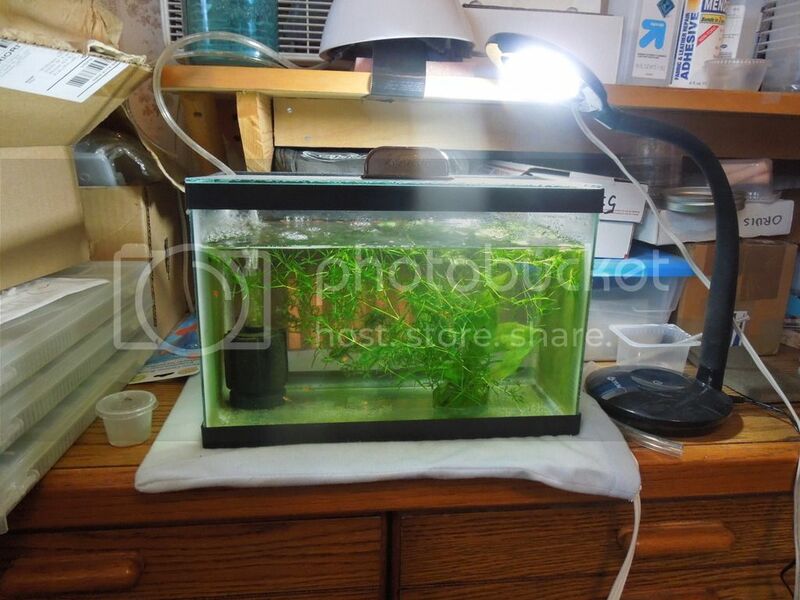 Also, make sure that you do a good vacuum on the substrate with each water change. Normal readings for nitrate should be less than 20 ppm. This is not based on your ammonia. It is a separate reading. If your readings are ranging from 20 to 80 ppm, I think that you might be overfeeding. The stomach of a fish is about as big as its eye so you don't want to give them more food than they can eat in a couple of minutes. My tap water is like yours for Nitrates and on myrecently set up tank I'm still fighting the brown algae, what I have started doing now is using a ion exchange filter media in a mini filter for 24 hours after a water change to get the worst out and some biological nitrate remover media in my canister although that is yet to pass the time for activation 2-3 weeks, I have noticed that although it stills comes back after scrubbing off it takes longer and that's with a dedicated UV steriliser and pressurised C02 running as well. Apparently its quite common for a newly setup tank and hopefully will balance out eventually, just keep on top of it. Also look at your lighting too much, to little, too long? I am dealing with the same thing in my newly set up 15 gallon. Such a shame because no sooner had I about managed to get the water looking clearish, the diatoms started taking over! I now use a Purigen insert in my filter (it's a little porous bag full of small granules) which is supposed to absorb and remove silicates and phosphates, amongst other chemicals, which contribute to the onset of diatoms. Haven't had it in long but it does seem to already be making a difference. I also have amano shrimp in the tank which could be helping to keep it at bay. Page created in 20.051 seconds with 18 queries.